Things to see and do when you visit Crieff. Visit Crieff recently invited us to spend a weekend in the Perthshire town. They think Crieff is the perfect short-break destination. There’s lots to see and do in Crieff, and The Wee White Dug will love it they told me. Wondering if Visit Crieff were just giving me their PR patter, we headed north to find out. 19 miles from Crieff we came to Huntingtower Castle standing proudly by the roadside. If it could speak, this Ruthven family fortress would regale us with tales of royal visits (Mary Queen of Scots and the ill-fated Lord Darnley once stayed there), hidden treasure and treason. The castle is remarkably well-preserved, and also unusual as it consists of two tower houses, set three metres apart. Our next stop was Muthill, just south of Crieff. In the middle of the village a striking medieval tower rises from a ruined church. It’s the stuff of classical paintings. A religious community was established on this site in the late 12th century and the tower dates to this period. The quality and size of the building hint that this was no ordinary parish church. It was clearly a significant church, possibly even linked to the Bishop of Dunblane. We wandered around looking at ancient tombstones, before peering inside the tower. Oh joy of all joys – inside were well-worn but instantly recognisable medieval grave slabs. two figures lay resting in eternal slumber, while a roughly carved cross slab was leaning against the wall. Next, The Library of Innerpeffray, Scotland’s oldest free, public lending library. It was founded around 1680 by David Drummond, 3rd Lord Madertie. Innerpeffray. It stands next to a Drummond family chapel built in the 1500s. The chapel was once home to a college of priests who prayed for the Drummonds’ safe passage to heaven! You’ll find the library a few miles south of Crieff in the hamlet of Innerpeffray. Seven miles west of Crieff, in Comrie we visited an unusual attraction on the edge of the village. Cultybraggan Camp, or Camp 21 as it was once known is a WWII POW camp surrounded by barbed-wire fencing. Lookout towers loom over rows of red-roofed nissen huts. The camp once held high-profile German POWs, including members of the Waffen-SS, U-boat crews and airmen. Wandering around you can’t help think that this would’ve been a pretty good place to sit out the war. A short distance from Cultybraggan Camp stands a much older relic of the past. In a leafy clearing are the remains of Dalginross Stone Circle. Only one stone remains upright, but it’s still an impressive site. Early “archeologists” excavated the site and found a cist containing a fragment of bone, and an urn filled with ashes. They’re long lost now. The team at Visit Crieff were right, we’d had a brilliant afternoon and seen loads already. It was now time to check out our accommodation. Knock Castle Hotel & Spa was our weekend base. The elegant 19th century mansion sits on the edge of Crieff in 3.5 acres of leafy grounds. Inside we were warmly welcomed, and a big fuss was made of the boy. He puffing up like a peacock as praise was heaped upon him. As we completed our check-in details we gazed around us in awe. The place was stunning, and we were thrilled to be staying there for our Visit Crieff weekend. The 4 star hotel takes real pride in creating a relaxed ambiance for guests. Subdued lighting and the tinkle of piano music, combined with an abundance of comfortable seating mean you lose all sense of time and urgency at Knock Castle. You rediscover the lost arts of conversation and quiet contemplation. It’s the perfect place to escape from it all. Our room was a junior suite on the ground floor. It was spacious and decorated in keeping with the grand old building. The king-sized bed was the most comfortable I’ve ever slept in. Our en-suite was stocked with quality toiletries from Scottish Fine Soaps, and it had a jacuzzi bath to relax in – perfect for weary Scottish explorers. Ambiance checks in the bar! We unpacked, then in the interest of research went to check out the hotel bar to make sure it complied fully with the hotel’s relaxing ambiance policy – it did! That evening, we ate at the Tower Gastro Pub in town. Having checked out their menu online we were really looking forward to eating there. The boy seemed equally excited to find himself out on the town. We were seated in the bar which was bright and modern, with a really welcoming vibe. We ordered drinks and they arrived with doggy treats for the boy. He was won over! The menu all sounded great, but we had favourites on it. For main I had chicken and lemon risotto with parmesan shavings – it was really tasty. I wondered if the lemon would overpower the dish but it complimented it perfectly. Mr G had macaroni topped with breadcrumbs. He could eat his body weight in macaroni and never tires of it. He devoured it with his usual gusto. For dessert we both chose a dish from the Burns Night inspired specials board. It was a dish that’s become the stuff of legend – the deep-fried Mars Bar! I’m not sure what I expected, but when it arrived it looked quite posh. I took a tentative taste….. It was fantastic. The batter was light, and inside the gooey Mars Bar tasted like heaven. It coated my teeth in warm melted gloop, and by the time I’d finished eating I must have looked like Shane MacGowan! It’s so nice when you discover dog friendly gems like The Tower Gastro Pub, as it shows that nice decor and well-behaved dogs are actually pretty compatible. Next morning, we had an early breakfast at the hotel’s rooftop restaurant. The views of the Perthshire countryside were beautiful. Outside, it was dreich but we wouldn’t let rain ruin our day. It could rain all day for all we cared as we had some of rural Perthshire’s most scenic roads on our doorstep. So, a rainy day drive it was then. I do love a remote drive when we’re cosy inside the car, with the weather raging outside. We barely saw another car as we drove north. Passing loch Na Craige our jaws dropped. We quickly pulled into a parking space to marvel in awe at the milky, white water. Puzzled, we tried to work out what had made the water so white, remarking that it looked like a white version of Iceland’s Blue Lagoon. It took us waaaaay longer than it should have to realise that we were looking at a frozen loch – doh! We drove on, passing through the town of Aberfeldy and heading towards the village of Kinloch Rannoch. Before arriving in Kinloch Rannoch we stopped at Tay Forest and set off on foot for a wander. We spotted a red squirrel bombing about, up trees, down trees, crossing the road then back again. An adorable little bundle of energy. Outlander fans will recognise the tree topped hill below. You’re looking at the ‘real’ Craigh na Dun, minus the time portal stone circle which (spoiler alert) doesn’t exist! I don’t get to visit this corner of Scotland very often, so it’s always nice to find myself in the area again. We stopped at the dog friendly Riverbank Cafe in Kinloch Rannoch for take-away coffee and cake. As we sat in the car enjoying our mid-morning coffee (me with beady eyes watching my every move) it began to brighten up outside. Keen to make the most of the blue sky we jumped out of the car like ferrets up a drainpipe. Fortunately we’d parked at the start of a scenic hill walk. The impressive Allt Mor waterfall thunders down the foot of Craig Varr getting the hike off to a scenic start. It was a steep and at times hellishly boggy hike but I didn’t care as I felt exhilarated. Nothing gives me more of a buzz than exploring Scotland away from the roadside. The higher we climbed the more patches of snow we saw. The boy was in his element and charged head first into each of them. It was so good to get up into the hills again. Just us surrounded by Scotland’s incredible, rugged landscape. After a satisfying hike up we turned and started our descent of Craig Varr. Looking up to our right we saw the majestic profile of stags way up the hill. The more we peered the more deer we spotted. The herd had spotted us too and eyed us suspiciously. Back at the Riverbank Cafe we feasted on soup, toasties and irn-bru before heading back towards Crieff. With patches of blue sky lingering the Perthshire countryside looked even more beautiful on our return drive. We drove on, passing a couple of favourite walks of ours. The Loch Freuchie circuit, then the Sma’ Glen where the giant boulder known as Ossian’s Stone stands. The monolith said to mark the grave of the bard Ossian, once stood where the road is now. It was moved when the road was built but it’s recorded that fragments of bone and ashes were found under it. Back at the hotel, and in need of some relaxation after our busy day I couldn’t resist trying out The Egg. The Egg is an automatic massage pod that will remind you of Mork & Mindy if you’re of a certain age! 15 minutes inside the pod is supposed to put you into a state of deep relaxation. I certainly felt calm not having to faff around taking clothes off and making chit chat with another human. Inside it was lit with a blue mood light. I lay down and hit the start button. The blue light faded and tiny twinkling stars appeared. Gentle music played and the smell of aromatherapy oils filled the air. The bed beneath me began to massage my legs, then my back and shoulders. I could feel myself drifting off, hypnotised by the twinking stars and music. When my 15 minutes were up I floated out of the pod on a cloud – seems it really works! That evening The Wee White Dug joined us for dinner at Knock Castle’s rooftop bar. The place was busy, but the ambiance was mellow. It’d been a brilliant weekend, and brilliant weekends call for bubbles, so we ordered a bottle of fizz to enjoy with dinner. We started with Crispy Haggis Cake with a Peppercorn Sauce and Sakura Salad from the bar menu. It was beautifully presented and tasted amazing, but it didn’t last long enough to photograph! For his main course Mr G had Smoked Haddock Risotto Topped with a Poached Egg from the bar menu. It looked delicious, but smoked fish was the stuff of my childhood nightmares, so I declined his offer to try it. He went into raptures about the dish as soon as he started eating. I had Vegetable Stir Fry served with Rice and a Popadom Basket also from the bar menu. It was simple but full of flavour, and one of the nicest dishes I’ve eaten in a long while. Freshly made Crepes with an Orange & Baileys flavoured filling, finished with Vanilla Ice Cream and Caramel Sugar from the a la carte menu were going to be impossible to resist. We both ordered them. Not only did they look amazing, they tasted amazing. It was the perfect dish to round off a perfect meal, and a perfect weekend break. The team at Visit Crieff were right, we did love Crieff. From outdoor activities, to whisky tours, spa breaks, history and more, Crieff has it all. So, the next time you’re looking for the perfect short-break destination – visit Crieff. Thanks to Visit Crieff for inviting us to check the town out. Although our accommodation was provided on a complimentary basis, all opinions are entirely my own. Thanks also to The Tower Gastro Pub for kindly inviting us to dinner. Hi Linda, I’m glad the post brought back happy holiday memories for you. It’s such a gorgeous area, I can see why you’re heading back to see and do more. It’s always exciting planning a new adventure. This trip was earlier this year. Feels like years ago now – it’s been such a quick year. Thank you so much for your blog! We are visiting next Sept and now we know just where to go! You make me want to be in Scotland soooo badly!!!! I feel really lucky to live in Perthshire and have so much on our doorstep. Sounds like you all had a brilliant weekend, great post. Thanks for sharing. 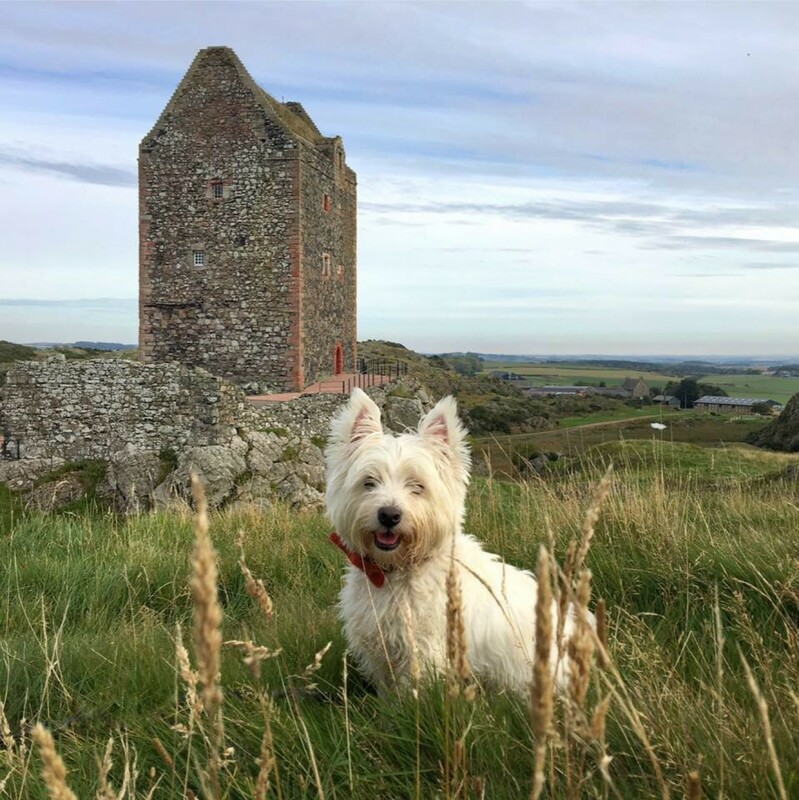 © Samantha Grant ‘Scotland with The Wee White Dug’ 2015 – 2019. Unauthorised use or duplication of this material is strictly prohibited.